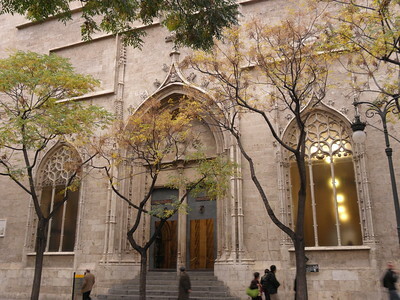 La Lonja de la Seda de Valencia is a 15th century Gothic masterpiece that was used as a trade hall and silk exchange. This commercial building was founded in 1469 as a market for oil. The design was derived from a similar structure in Palma de Mallorca. The architects were Pedro Compte, Juan Yvarra, and Johan Corbera. It was not until 1498 that the crenellated tower and the Flamboyant Gothic trading hall were completed, and the whole complex was finished in 1533. 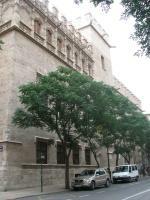 The building became a symbol for the Golden Age of Valencia, when it was one of the great Mediterannean mercantile cities. During subsequent centuries, La Lonja functioned as a maritime trading centre and a silk exchange. It still is used for commercial purposes. The site includes the main Contract Hall, the Pavillion of the Consulate which was the seat of the Tribunal del Mar (merchant tribunal) and the central tower. This is only one building, so my visit wasn't too long. At the entrance I opted for the guided tour, which turned out to be very informative and was conducted (in Spanish) on a one-to-one basis. The start of the tour is in the main hall, which I also found to be the most impressive part of the building. It is no coincidence that it looks like the interior of a cathedral, as the wealthy merchants decided to emulate the religious symbolism because their trade was looked down upon. The large, spiralled columns that dominate this hall represent palm trees: the columns used to be painted brown, their tops green and the ceiling sky blue. What a difference that must have been! Now all is the same kind of grey, a bit like when you're visiting Roman ruins and all those monuments look the same colour too. The rest of the complex consists of a courtyard, a chapel (with pretty Renaissance wooden ceiling) and the tribunal room on the second floor (also with excellent ceiling). Although the main rooms are quite empty and austere, in the corners, around doors and windows, there are tiny sculptures. They often are grotesques and it is a delight to check them out. Actually, I visited La Lonja twice (the batteries of my camera ran out halfway during the first visit) and didn't regret it. There are a lot of interesting details, and I liked the atmosphere in the evening when the lights are switched on. I visited this WHS in March 2016. I found a very good last-minute low-cost deal and booked straight away, totally unaware that the Fallas Festival was in full swing. I found out about the Fallas Festival after booking my flight and rental car as ALL the hotels in Valencia were fully booked! In the long run it only meant I had to modify my initial plans for the rock art visit and I slept in Elche instead which was very cheap. The main difficulty I encountered was parking once I arrived close to Valencia's city centre. All the main parking lots were either closed or not accessible as the Fallas floats were blocking every other street. After a few attempts and U-turns I parked my rental car at Garaje Guimerá which is just 1km away from the Lonja de la Seda. I was lucky to be there early in the morning as it was completely full in the afternoon. I could have used the metro from the airport to get there but I managed just the same. The festive atmosphere all over Valencia enhanced the overall experience as on the whole there isn't much to see apart from the silk exchange, the cathedral and the Plaza de Toros in the city centre. On the way back from Elche, I visited the City of Arts and Sciences and although I'm not a fan of modern architecture I would be in favour of its inscription on the WH list. Since I visited the Lonja on a Saturday entrance was free of charge and apart from a few tourist groups doing a touch-and-go visit as part of a city centre tour, there were long intervals during which I had the silk exchange for myself. The main highlight is of course the main hall with the spiral columns known as the Contract Hall. The modern retro-looking chandeliers offer adequate lighting and even though the ceiling is not painted anymore and there is no furniture left inside, the gothic hall is still quite beautiful. The style is quite reminiscent of the Manueline style I appreciated all over Portugal. 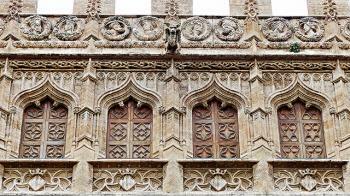 I really enjoyed focusing on the tiny interior and exterior gargoyle sculptures adorning every window and every door. The facades and especially the windows of side-wing (picture), named the Pavilion of the Consulate, are really worth viewing from the orange courtyard. This was the seat of the Tribunal del Mar, the first merchant tribunal in Spain. The room in the first floor has a richly decorated ceiling which is a masterpiece of medieval art. 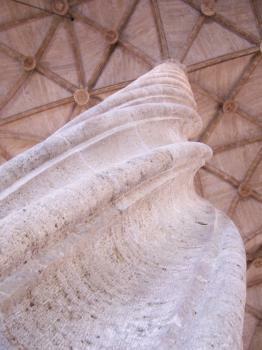 It is said that the King had visited Valencia just to see this ceiling. It reminded me of another ornate ceiling I had seen in Zaragoza in the Aljafería Palace. The geometric floor tiles in this room have a similar design to the one painted on the walls of the Albi Cathedral in France. Once you go down the stairs, you will see the white marble Unesco plaque which is pretty much the only sign you will see in the Lonja. This is not a bad idea as information boards tend to spoil the integrity/view of rather small closed areas. Instead there is a very informative audio guide for only 3 euros as well as an information video on display free of charge. I enjoyed my visit even though it doesn't really offer anything which is really that unique or of OUV. Especially Italy but also most of Europe would easily triple their amount of WHS if UNESCO were to inscribe sites based on a particular unique feature of importance. So in my opinion this is one of those WHS which simply add nothing to the WH list. I went to the Valencia Silk Market with a couple of friends in June 2014. It is located opposite the Central Market, which is a wonderful covered market housing many dozens of food stalls. Being in a place like this makes one realise how homogenised and bland the food shopping experience has become back home. The Silk Market costs €2 to get in, which is cheap of course, but it’s not a large building. The reason it was inscribed on the UNESCO list is because it is one of the best examples in the world of secular Gothic architecture, and was used for its original purpose for more than 500 years. The silk that was traded here was harvested in the surrounding countryside from the cocoons of silkworms that inhabited the mulberry tree. Although they don’t exactly look alike, there is a reference to trees in the Sala de Contratación (trading hall), where the columns meet the roof in a manner designed to evoke palm trees. Another interesting feature of the building is the stereoscopic – or 3D – floor. There is also an unconventional spiral staircase, constructed without a central column. This was done to show off the marvellous wealth of the city. Unfortunately you can’t walk up it, though you can use a different staircase to get to the upper floor. In terms of the visiting experience, the market could be improved by some English descriptions. As it stands, the signs are all in Spanish only, so it is not easy for tourists who haven’t read up on it to understand exactly what it is they are looking at. Somehow I can't quite agree with the positive reviews below. I do not deny the historic and architectural merits of the Silk Exchange, nor its WH value. It's quite an interesting building with some nice features (the columns in the main hall, the ceiling on the upper floor, the courtyard), and it certainly has its place in the history of business and economics. The problem is just that the organization and presentation are really terrible. The guided tours and the movie are only in Spanish (I do understand it reasonably well, but still, Valencia is full of international tourists, and the nearby cathedral, famous for its "Holy Grail", has audioguides and brochures in a whole bunch of languages) and there is nothing in the way of explaining what you can see (there are no signs or brochures whatsoever). So after walking around the building for about 15 minutes, there is nothing more to do and you have ticked off another WH site without having increased your knowledge of it at all. The upside is that the fee is only 2 Euros (as of 2012), and of course Valencia has a lot of other attractions, especially the impressive City of Arts and Sciences. Valencia is one of those cities that make me love travelling in Europe. Whilst I really enjoy visiting the big cities Paris, London, Rome etc. it is the dense cluster of smaller cities that make travelling around the continent really rewarding and also account for the huge concentration of World Heritage Sites in this small part of the world. La Lonja de la Seda is a pretty impressive monument to Mediterranean mercantile trade, and as outlined by David below has some fine gothic architectural detailing, and I am in full agreement that the one truly exceptional part of this are the spiral pillars of the main trading hall (picture). The courtyard garden and ceiling in the upper chapel are also very nice. On the whole though la Lonja is nice but nothing that I would really say was exceptional. One quibble I have with the site is that aside from two signs displaying the WHS symbol there is absolutely no information on why this is an important/ exceptional building, there were free tours every hour or so, but unfortunately my Spanish is terrible so I couldn’t take advantage of this. It would be nice just to have an explanatory board or leaflet/ guidebook available, I had to rely on the advisory body report on the UNESCO website to put this place in some sort of context. Anyway this was far from an unrewarding ‘city break’. La Lonja sits in a nice part of the old town with a wonderful ‘Modernisme’ market directly opposite, great for picking up fresh produce for lunch. There are also plenty of restaurants and bars around, we had a great evening eating at the unique Bacca D.O.C just behind La Lonja before bar hopping until the small hours in Barrio del Carmen. The rest of Valencia’s historic centre was nice, though I wouldn’t say it was of World Heritage standard it does have plenty of worthy monuments and plenty of bars to sit and watch the world float by. It is also handy that the weather was fantastic when we visited and there is a tram direct to the beach. However Valencia has a huge ace up its sleeve. In the 1960’s the river Turia was diverted to help control flooding, this has been turned into a sweep of parkland, which is a real joy to wander around. However about 1 mile south of the city centre there is a remarkable venture taking shape. Valencia born architect Santiago Calatrava is creating something astounding in the shape of the City of Arts and Sciences (see my profile picture). The already completed projects are exceptional and warrant at least a half-day of exploration. The Palau des Artes Renia Soifa (Opera House) has to rank as one of the finest buildings I have ever visited. Even if you are not a modern architecture aficionado these are instantly accessible and joyous buildings and I wouldn’t hesitate in supporting them as a future World Heritage Site. There is also a link to la Lonja as Calatrava was greatly influenced by the pillars of the main hall, this relationship can easily be seen when looking at the pillars around the Science Museum and l’Umbracle. All in all Valencia was a fine place to spend a few lazy days, and whilst la Lonja may not be the most exceptional of WHS you will be able to see something of outstanding universal value actually being created. Highly recommended! In our travel around Spain we have been to the beautiful city of Valencia and have visited the Lonja de la Seda (Silk Exchange), a nice group of buildings built between 1482 and 1533 in Late Gothic Flamboyant style, originally used for silk trading and then for commerce in general. The rectangular space of the Lonja includes the huge Trading Hall, the square Tower with the Chapel, the Consulate and the garden. The exterior of the buildings (to visit it well you have to see all the façades) is crenellated and finely decorated with ornamented windows and doors (the main doorway is the nicest), gargoyles, coat of arms and religious and profane sculpture. The most noteworthy features of the exterior are certainly the nicely decorated windows of the upper floor of the Consulate, also with portrait medallions and gargoyles, forming a sort of gallery. The exterior of the buildings is certainly nice, but in my opinion it isn’t exceptional, because there are many palaces comparable to this one. The interior is opened from 9.15 to 14 and from 17.30 to 21 (in winter from 16.30 to 20); it is always closed on Monday and on Saturday and Sunday there is a free ticket. The main feature of the Lonja is the enormous Trading Hall. It is divided in three aisles by five rows of incredibly high and strange spiral columns (this is in my opinion the only one feature of the Lonja really stunning, even if it isn’t unique; for example, it reminds me the columns of the church of the Jacobins in Toulouse) from which the vaults spring; interesting is also the Latin inscription in Gothic characters on the walls and the coloured floor. Adjacent to the Trading Hall is the square chapel, on the ground floor of the tower, with nice vaulting springing from the corner columns. The three storeyed Consulate building contains on the first floor the Gilded Chamber, with carved, gilded and painted decoration, notable above all because its really beautiful coffered ceiling, and on the ground floor an absolutely ordinary and even not nice room. Apart from the WHS, the historic centre of Valencia as a whole is beautiful and contains many important monuments, nice streets and squares. The most important building is the cathedral, a mixture of many different styles, the most composite church I have seen in Spain, with a fine baroque façade, a strong Gothic tower, beautiful portals and above all the finely decorated drum. The most beautiful view of the cathedral is from Virgin Mary’s Square, on which overlooks the strangest façade of the church, very unusual because of its strange Renaissance loggia, which looks more as a façade of a palace. Other important monuments are the huge Generalitat Palace, quite similar in the late Gothic style to the Lonja de la Seda, the incredibly enormous Gothic twin city gates of Serrans and Quart, among the most beautiful I have ever seen, and the Renaissance Patriarch’s College. A special mention should be made for the Marquis de Dosaigües’s Palace, certainly the most beautiful in Valencia, with stunning reliefs, sculptures, an incredibly fine portal and the perfect contrast of many harmonic colours. Valencia has also some of the most beautiful buildings of contemporary architecture in Europe in the breathtaking complex of the City of the Arts and the Sciences, 350000 square metres large, mainly built by Santiago Calatrava, with huge buildings like the Sciences Museum, the Arts Palace, the “Hemisfèric”, the “Umbracle”, the “Oceanographic” and the works for a lyric theatre still going on. A very unusual feature of Valencia is the park placed in the huge bed of the dried river Turia, where is also the beautiful Palace of the Music and the Exposition Bridge. I quite liked the Lonja de la Seda, but I think it is worthy of a visit if you are in Valencia more than of a long travel to visit expressly it; however the whole historic centre absolutely deserves a visit, as it is really beautiful. I think that it could be inscribed on the WHL entirely and not only the Lonja de la Seda, which in my opinion, even if it is very nice, authentic and conserved, isn’t really unique on its own as there are many similar beautiful palaces. In the photo is the main façade of the Lonja de la Seda. Prison: "On occasions, the Tribunal would imprison merchants for debts in the central tower of La Lonja - the third part of the structure." 168 Community Members have visited.